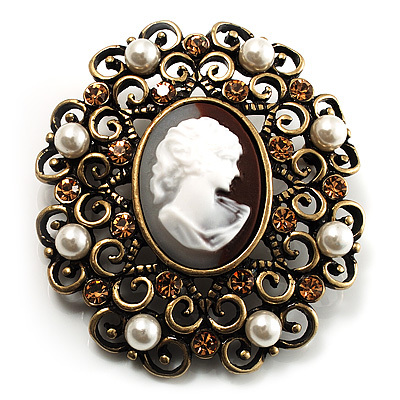 Take a new direction in your cameo collection with this Pearl Style Filigree Cameo Brooch (Bronze Tone). The handcarved profile of a young lady with an uplifted gaze, sweet smile and long wavy hair graces the stone. The filigree frame crafted in bronze tone finish and decorated with white faux pearls and citrine crystals, offering a vintage look. The brooch measures about 55mm x 45mm and fastens securely with a metal pin clasp.